The best body pillow is a great way to get extra comfort and support when regular head pillows just aren’t enough. These are larger sleeping aids that not only let you rest your head and neck on it but also allow you to do so with the rest of your body. While they do take up a larger amount of space on the bed, body pillows offer relief to back pain, shoulder problems as well as hip discomfort. They’re great for pregnant women as well as side sleepers as well. If you fall under any of the categories just mentioned and haven’t gotten the sleep you need using regular pillows, maybe it’s time to use a body pillow. Best Body Pillow: This is a C-shaped pillow that hugs your entire body. Its design makes it great for pregnant mothers as it contours to your body and lets you hug it as well. We like it in that it works not only for expecting mothers but everyone else as well. The Leachco Snoogle is a full body pillow. It offers support and comfort that will let you enjoy your sleep. And it is able to do this because of its shape which covers the back, neck and hip areas. This pillow can replace those heap of pillows that you have on your bed right now. You can shape it however you want it because it conforms to your body. It is long enough and heavy enough to provide you with the comfort you are looking for. 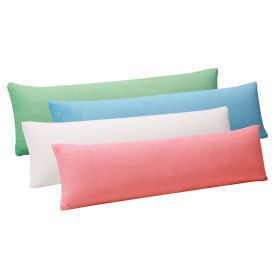 The material of the pillow is polyester and it is phthalate, latex, lead and BPA free. This makes it soft to the touch as well as safe for use by you or your family members. Its cover is removable and can be easily washed. The pillow can be an alternative to help you in alleviating your aches and pains. If you are pregnant, this pillow will support your tummy as well. This is a great benefit and can be used after birth to support your baby during nursing as well. Affordable Body Pillow: The award for the lowest cost in our body pillow reviews goes to the Pinzon Basics pillow. This gives you something that you can enjoy with the pillows you already have or to replace some of them. We like this sleep companion in that it will leave you feeling refreshed when you wake up. It does a great job when used to support your back. Or, if you’re a stomach sleeper or side sleeper, you can use it as something comfy under your belly. This is a more traditionally shaped body pillow in that it comes in the shape of a straight tube. Unlike the Leachco above which is C-shaped, this may makes it easier to move around in bed. This pillow is also great for expectant mothers, anyone with chronic back pain, or for anyone that just likes to snuggle. It has a length of 54 inches long and is 20 inches wide. Inside, it contains 77.5 ounces of down alternative hypoallergenic polyester. This makes it soft enough to cuddle with but firm enough to offer support. Best of all it is hypoallergenic. The pillow is made to conform to the shape of your body. And its cover is 100% cotton with a 230 thread count that can be easily removed for cleaning. Shredded Memory Foam Body Pillow: If you don’t want any regular fluffy pillow but want something conforms to your body, then this Coop Home Goods pillow is for you. The Original Shredded Memory Foam pillow made in the USA, and we like it because of the material it is made from. It comes with high quality components that help you sleep better. It is different from down pillows in that it doesn’t give way as easily. While down pillows are soft, they also don’t offer support. Meanwhile the opposite is true with memory foam pillows. Pillows made from memory foam offer support but can get very warm. This can cause them to be comfortable after a while. Plus their thickness can’t be adjusted. The shredded memory foam technology mixes the best parts of down and regular memory foam. Because of this you get enough support but the foam allows you to thin out or fluff up the pillow the way that you want. This gives you the sleep support and plushness you need to get better quality sleep. Like the Pinzons Basics above, this pillow measures 54 inches long and is 20 inches wide. These pillows are hypoallergenic and will stay free from dust mites. With them, your temperature will be regulated to a comfortable level thanks to the 40% bamboo viscose rayon and 60 % polyester fabric used for the cover fabric. If you love medium to medium firm pillows, then you will think that this is the top pick in our body pillow reviews. The Sleep Innovations Embrace pillow that is great for side, back and stomach sleepers as well as expectant mothers. This pillow measures a similar 54” long, 20” wide and is 6” in thickness. This gives you that oversized pillow that you can lean on or cuddle with. It is also designed to conform to your entire body. This sleep companion has a micro-cushion core that provides the support you need. It is made from SureTemp Memory foam, which is different from regular memory foam because the airflow is increased as well support. The added air flow also reduces the heat that memory foam is often associated with. In addition, the memory foam is also made of gel, which will constantly adjust to your body temperature and keep your pillow cool. This product is great to use for alleviating aches and pains and a comfortable rest. With the material of this pillow, you do not have to worry about dust mites or allergens. It also includes a removable plush pillow top cover that is washable. Everyone’s body is different. For this reason, the pillows that work for other individuals may not work for you. It may be because of your body type, your sleeping position, some previous injury or health issue. But whatever it is, if your regular head pillow isn’t working, a good body pillow may be your answer to getting better quality sleep nightly.